The Futuristic City of Gurgaon is in truth weighed down with a lot of past. Like this Nirula’s outlet in the tidy Hawker Street in Ambience Mall. Millennials might be clueless about the outlet, but it does light up the eyes of an earlier bunch of folks hailing from our blessed National Capital Region. 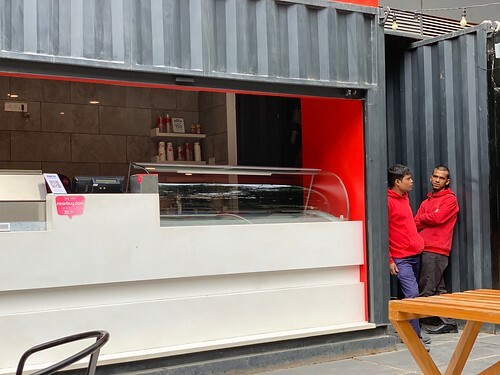 At one point in Delhi’s contemporary history, this restaurant chain used to virtually manufacture memories. Here, the youthful crowd would gang up through romances and breakups. And, lest anybody forgets, this was the place where many Delhiites tasted their life’s first banana split. 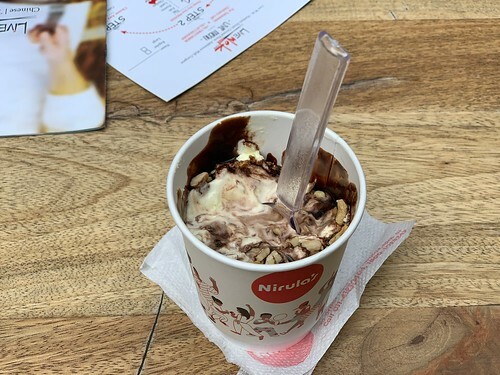 The epic thing, however, was Nirula’s hot chocolate fudge. Be gentle though, and utter its name with care. Even a fleeting mention can break the hearts of at least two generations who used to lovingly call it HCF. Till 2010, you found more than 80 Nirula’s blanketing the region. Every neighbourhood worth its salt just had to have one. Now, only about 30 remain, with five in Gurgaon. And one of them is this tiny kiosk standing out like an ageing uncle on a lane full of fancy joints. The menu still lists that cherished classic. 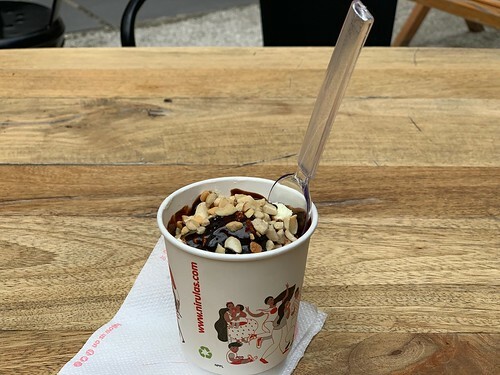 The traditionalists expecting tall elegant glasses of yesteryears should be emotionally prepared for at least one sure shock— the sinful dish now comes dressed in a paper cup! 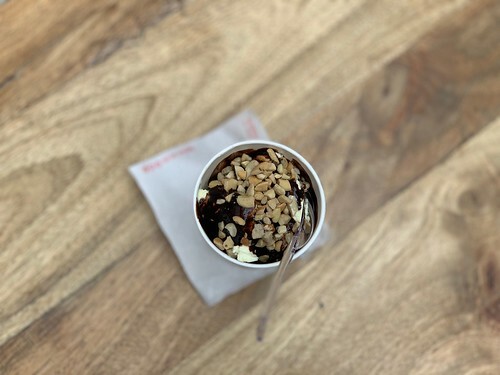 Otherwise this hot-and-cold blend of vanilla ice-cream and fudge is fairly addictive, though only the oldies can confirm if it still tastes the same. Maybe that doesn’t matter. The point after all is to experience a Delhi that was. Come here with a friend who grew up during the 1990s so that—over a session of HCF—she can gossip about our elders who came of age while flitting in and out of all those Nirula’s that no longer exist. Hey, I’m a Millennial and MY eyes light up whenever I see a Nirula’s outlet! It was pretty popular in the 90s and early 2000s. I think you meant ‘Generation Z’ ( godless heathens!) up there. They grew up with cookie-cutter McDonalds , Domino’s etc etc. Some of them who can’t tell a Wimpy from a Rimpy are ‘foodies’ now. Back in our day, we had to wait for stuff and that built our character. There was grit and gristle in our burgers/ fries/pizzas and we had to live with it. Ketchup/mustard didn’t come in neat little pouches; we had to squeeze it out of silly looking dispensers. Some of those dispensers had googly eyes on them too. And we didn’t have no Yelp or Zomato to help us ‘find the best restaurants’ or whatever . Lily-livered Generation Z has been spoiled beyond redemption. Even our drinks and ice-lollies had dangerous amounts of food colour. I personally got a fluorescent purple/orange tongue every time I drank a particular brand of ‘fruit juice’ that was sold near our local Super Bazaar. Our toffees had fake milk and our lollipops gave us toothache. And do not get me started on the video games and cassette players. It was a wild time but we turned out fine. 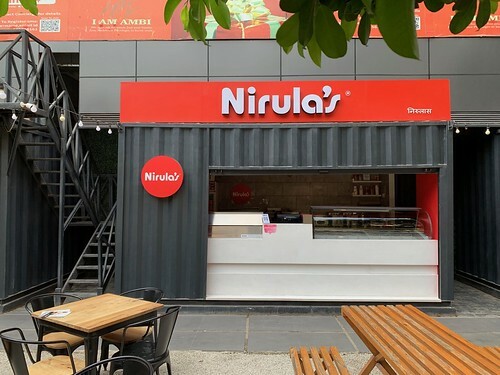 Now there’s a Nirula’s right in my neighborhood ( Near Peach Tree, Gurgaon) and I can have my fill of mutton pizzas, grilled sandwiches and juicy rolls. The clueless babalogs of Generation Z can flock to their gastropubs , bottleopenerwallahs and furzee cafes but I will stick to my roots!